After our eventful race last weekend I looked under the car which had bottomed out and realised we’d better check that engine! 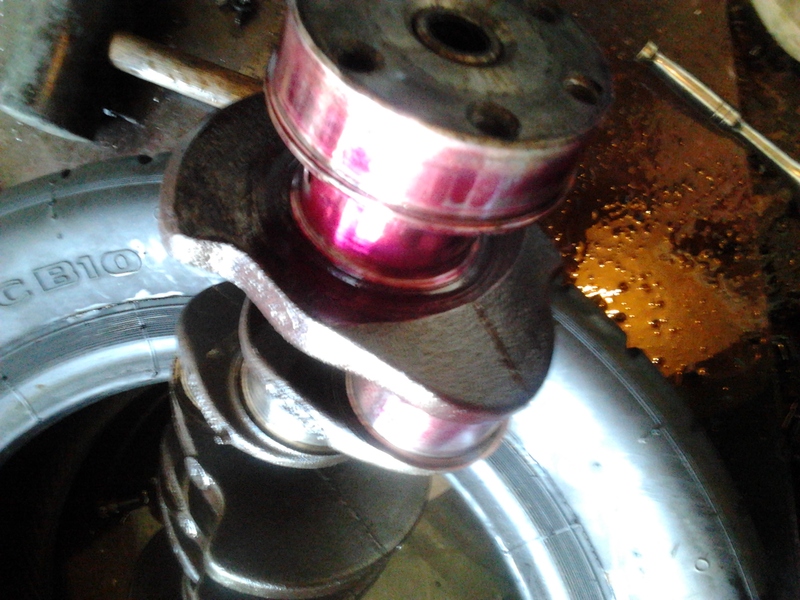 The flywheel on these engines can hit the floor which can put a crack in the crankshaft around the rear main bearing. I’ve had two engines with crack here. One blew up in Anglesey and the other was condemned in an engine builder’s workshop as being close to the big bang. We want this engine back in the other car by the end of the week so we tipped it on some tyres and got the crack out quickly. Armed with some Ambersil Leak and Flaw detector (http://uk.rs-online.com/web/p/leak-flaw-detector-sprays/4955027/) we sprayed the centre main bearing and the area of the crankshaft which is subject to cracking. I was keen on spraying the main bearing as the previous engine had a crack in it here. Since I first drove the car with this engine it had low oil pressure (35psi on the straights) so I suspected this engine had the same problem. I hate being right sometimes… the centre main bearing shell gave it away (as did the oil pressure) before we even got the spray on. It was badly worn and yes there is a crack here. 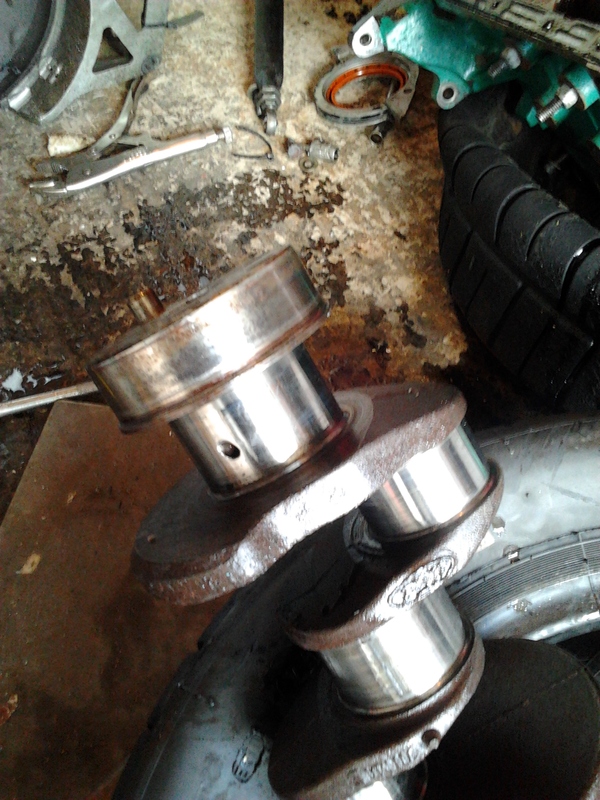 Luckily, well sort of, the crank is fine but is scuffed a bit. That’s it for this block really. 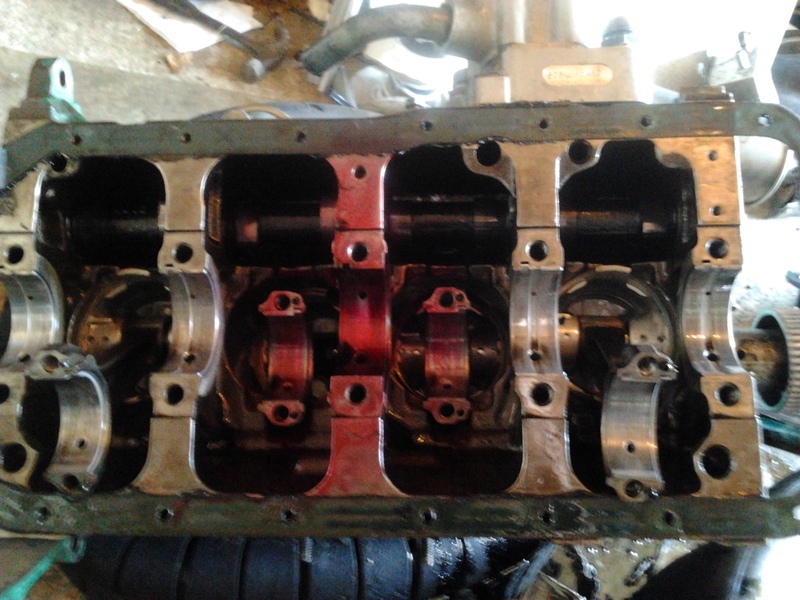 I need an engine in the car by the end of the week so I put it back together. The way the engine builder (believed to be Stevie Patton) sets the cam timing is to put an undersized dowel in the camshaft drive and use the bolts like a vernier. We tried to mark the position but I think we lost it so it’s also likely to be down on power now too! All round a bit of a rubbish day but it made it easy to decide on what to do next. Sell the 88 cheap and buy a brand new, crack free engine. I never liked that car anyway! Following on from building the car in a few evenings some problems we faced re-occurred to make this round more of a test session than a race. Michael qualified 6th out of 19 after 10 laps which was not bad considering the car had a major handling issue and we hadn’t tested the car until that session. Unfortunately the clutch failed in qualifying and we did not get this fixed for race 1. Race 2 we started right at the back but with a hampered car Michael failed to make progress. The main issue with the car which we could not address was the lack of rear droop. The speed at which the car was re-assembled meant we had to assume the spare dampers fitted. Sadly they did not allow for any droop in the rear suspension which badly affected traction out of corners. A weekend that promised so much and delivered so little mainly due to Michael screwing it up! A flat new tyre did not help leading to guessing a setup. A botched up crash repair job. And speculation as to why a smashed up race car was faster than the one painstakingly setup by someone not very good at painstakingly setting up a race car! We were at Silverstone today testing the newly rebuilt M88s for any issues. We had some pretty crusty old tyres from 2010 to use so were not expecting good lap times – it was really more to check everything was OK. We were a bit late turning up and then spent most of the first session finishing the car off. Mainly the ignition timing and a few other bits. We managed a few laps right at the end. The car clearly had something amiss at the front as it was poor on turn in, had understeer and a tendency to grab the front brake. When we looked it over the front ride height had been set to about 60mm instead of the 42 we aim for! This can be explained by the setup being done at 9pm on Wednesday night in about 30 mins. With this corrected the car handled much better but I suspect as the driver the front left was still a bit light. Also towards the end of the day the front left was completely butchered and gave the car horrific unersteer going right. Going left through Brooklands it was a nice car showing the basic setup was quite good. The biggest problem of the day was the intermittent coolant temperature sensore which defaulted to 128C. Not reassuring but when it did work it showed 90. Still a bit high. After compression testing the new car’s engine we found one cylinder giving a healthy 180psi compression whilst the other three were around 90psi. Not so good! 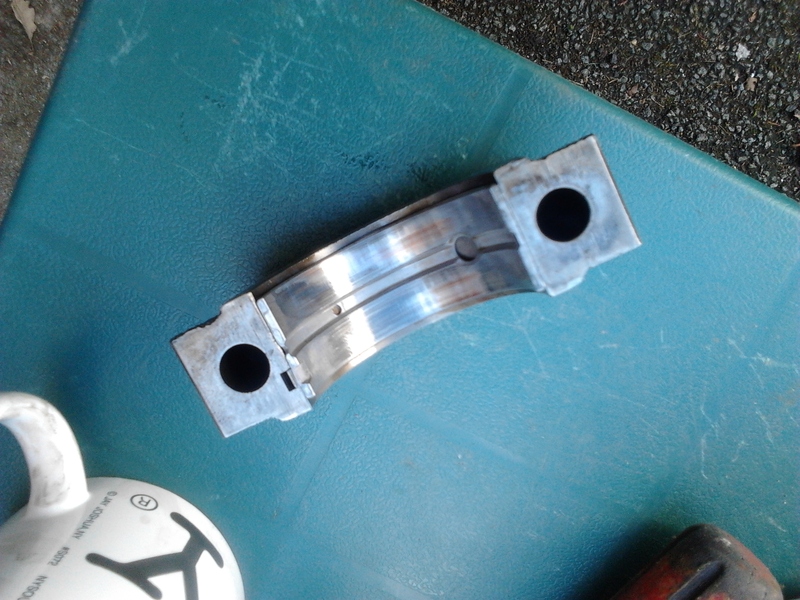 The bottom end was relatively new so we turned our attention to the head and suspected the valves were bent. This was more than a hunch the car had a problem getting into 3rd gear which Michael and the previous owner had had trouble with. This will inevitably lead to over-revving on upshifts if not very careful. 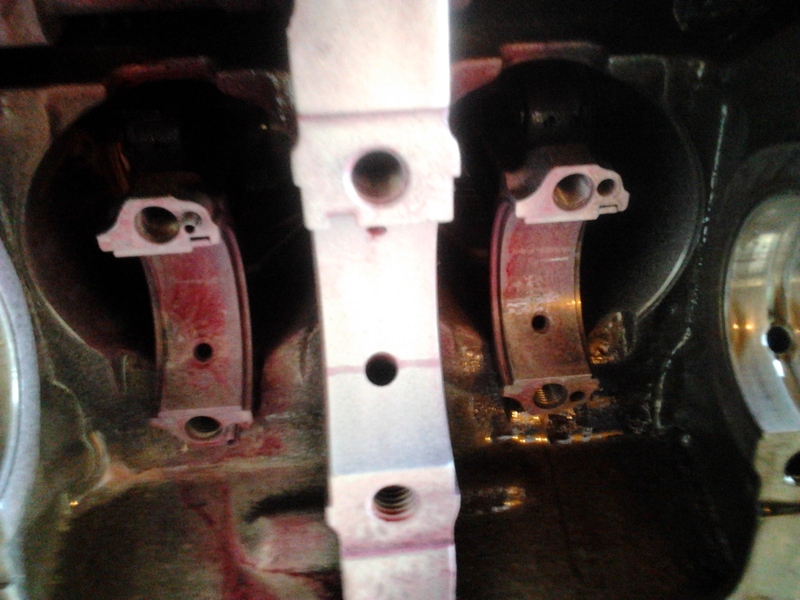 If you over-rev (buzz) the engine the springs will not be able to close the valves quick enough for them to be out the way of the piston which results in impact between the two. It may only slightly bend the valves but that’s enough to lose compression. Moreoever the contents of the combustion chamber will end up back in your inlet and exhaust manifolds at the wrong time harming the pulsed flow. Without vacuum testing equipment, Michael had to get innovative with his testing of the valves. 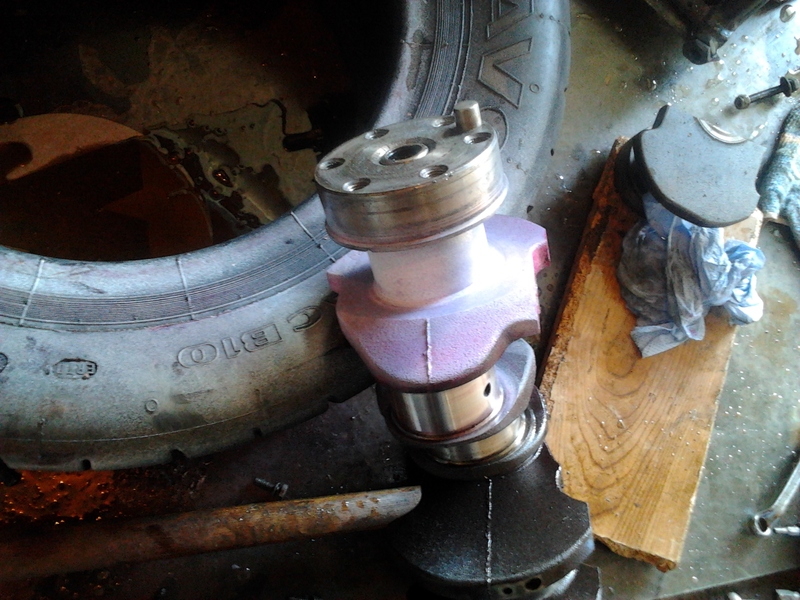 Poor man’s damper dyno – testing if dampers actually work! We needed to operate the damper (AVOn monotube no gas) at full force in the horizontal position to see if it will work like this. Spoiler alert! It doesn’t. You can feel the air which gets into the valves once it has been removed. Also a few boring calculations about spring rates and leverage! 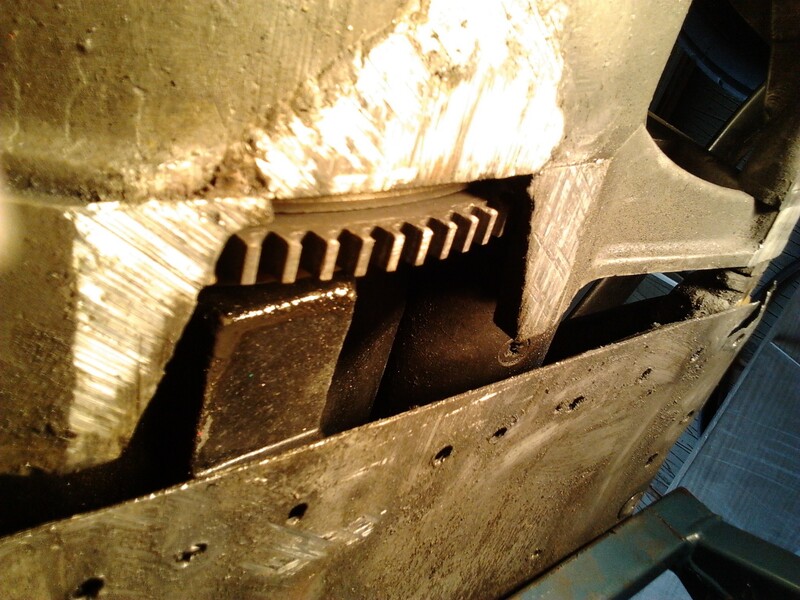 Michael reviews how the dampers affected the handling of the M88s and M89s Mondiale Formula Ford race cars in 2014. Towards the end we discover why dampers without any nitrogen in them won’t ever work mounted horizontally as on the front. Basically 13 minutes of waffle!